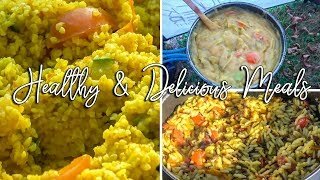 In this video we are willing to share with you 3 of our favourite easy to cook meals on a daily basis when we are on a long hike and out camping. We realized that these are the dishes that we most often go for and like the best. All of them are going to be vegetarian friendly, have simple ingredients, based on grains and using as much of the fresh vegetables as possible. So if you are a lover of home made and healthy food this is a video for you! Let's get started! Let us know which meal out of three you prefer more leaving us a comment below. 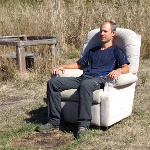 And feel free to share your own favourite meals to cook when camping, we would love to learn new tricks and techniques. We are a young couple who loves hiking, nature walking and camping. We choose walking over driving and other types of transportation whenever we can. Also we have a Youtube channel where we're showcasing all our hikes. In the US everyone is obsessed with weight, but it is relatively easy to find dried products, or dry them yourself. I make a similar grain dish but use dried veggies and cashews instead of fresh veggies and cheese. I like your technique of dry-roasting grains before adding water. But please consider substituting cabbage for iceberg lettuce! Usually I don't get nearly as fancy - throw a bunch of nuts, bread, dried fruit, and cheese in a bag; then weight it and aim for about 800g per day! Thank you. It is our priority as well to go as light as possibe. So we are always happy to find good quality dried products or even learn how to do it ourselves would be great. Whenever we have access to buy any fresh fruit or veggies we go for them. However we realize that it won't be available to us every hike that we do. Cashews are a great idea, have to try them too. We actually used iceberg lettuce, it wasn't a cabbage, probably wasn't obviuos in the video itself. I mean the reverse. Cabbage is much more nutrient dense and durable. I take it everywhere. My personal goal of the past 20 years is to rid the world of iceberg lettuce. Unfortunately I haven't made much progress yet. Oh, that's a new information for us. We don't know much about that. Can you suggest any resources to learn about it? Cabbage is indeed a solid choice for hiking. It stays fresh a long time, can take heat, and doesn't turn into a mush pile like lettuce does. It fills you up as well! I love Phad Thai on the trail. I use the premixed spice envelope with additional oil, soy sauce, rice noodles and a protein of choice such as peanuts, cashews, tofu, chicken, or tuna. I also am a fan of cabbage on the trail. Onions dried or green fresh make a good garnish. One variation is to use cabbage in place of noodles. My standard emergency meal is instant mashed potatoes with whatever I have left smooshed in. (much like your first entree) Thanks for sharing! Thank you for your comment. Haven't heard about Phad Thai before but it looks like a great mix of different products. Cabbage will be our discovery this year on the trail, we are excited to try it out. Yes, mashed potatoes are great for having a quick meal. I like me my cowboy wraps. Wrap whatever ya got up in a tort' and pound it. Heavy on the cheap hot sauce!